What is a Target Date Fund? How does a Target Date Fund work? Picture the altitude of an airplane from the time it reaches its cruising altitude until it reaches its destination. Roughly, it resembles something like Figure 1. 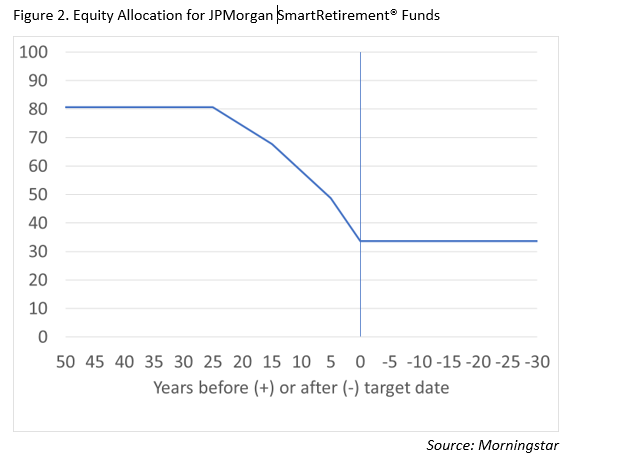 To illustrate how this pertains to a particular target date fund, Figure 2 depicts the equity allocation schedule used by the JPMorgan SmartRetirement® family of funds. See if you can recognize the airplane’s glide path from Figure 1 in the equity allocation in Figure 2. Notice the fund’s equity weight begins at 81% and remains there constantly for a few decades (reminiscent of an airplane’s cruising altitude). Starting at 25 years before the target date, the equity allocation begins its descent, eventually stopping its descent (“landing”) at the target date with a weight of 34%. When saving for retirement, your equity allocation is the major source of growth and of risk in your portfolio. Equities have higher expected returns than bonds and cash do. However, equities also have a higher risk of loss than bonds and cash have. Deciding how much to invest in equities requires deciding the best trade-off between expected return and risk of loss. When you have decades to go before you withdraw from your savings, you can allocate most of your portfolio to equities because, even though your portfolio will probably experience losses along the way, it has enough time to recover down the road. As you age, your time horizon shortens and your portfolio’s capacity for recovering from losses shrinks, so the conventional wisdom is to allocate more conservatively as your retirement date nears. Compared to a DIY investor, a typical target date fund solves all three of these errors. In that sense they offer a convenient benefit to 401(k) plan participants who don’t know how to diversify or how to allocate according to lifecycle theories of investing. While we acknowledge the benefits of target date funds, we also need to point out their two major shortcomings. First, there is no such thing as a typical target date fund. Asset allocations, glide paths, and the selection of underlying funds vary widely. Second, target date funds don’t give participants advice, so their use makes for an incomplete retirement solution. There are two different types of : “to retirement” and “through retirement.” The one depicted in Figure 2 is “to retirement,” because its equity allocation stops descending at the target date. 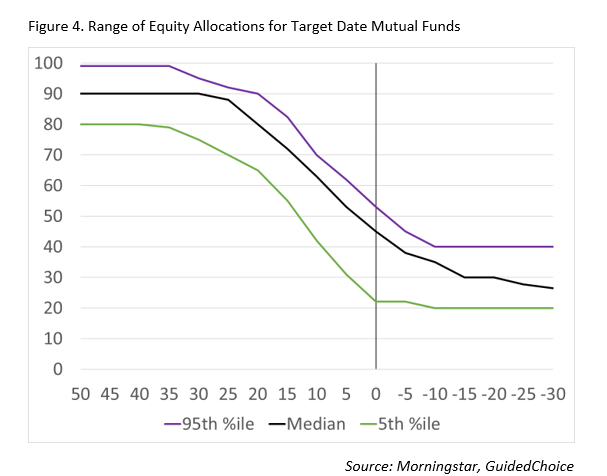 More common are target date funds with “through retirement” glide paths, whose equity allocations do not stop declining until years past the target date. 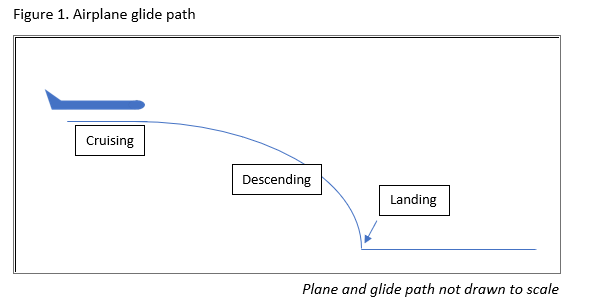 To see a specific example, we illustrate the glide path used by the fund family with the most assets in target date funds, Vanguard, in Figure 3. Vanguard’s equity allocation begins its “cruising altitude” at 90% of the allocation, 9 percentage points higher than the JPMorgan allocation depicted in Figure 1. At 25 years before the target date it begins its descent. 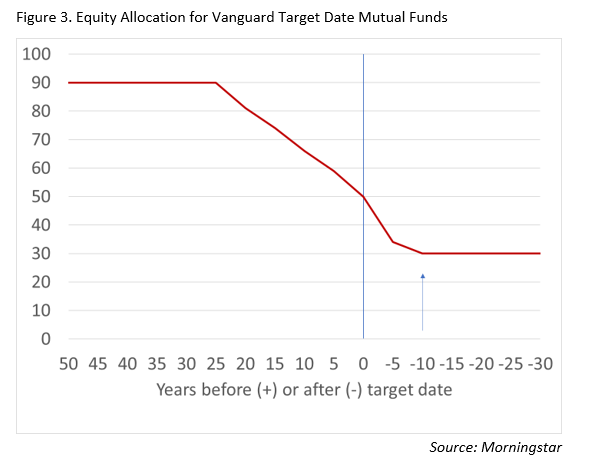 Notice that the Vanguard equity allocation does not stop descending until 10 years after the target date (notice the arrow). So, while the JPMorgan allocation stops descending at its target date, the Vanguard allocation does not stop descending until 10 years after its target date. In glide path terminology, Vanguard “lands” 10 years after its target date, while JPMorgan “lands” on its target date. This illustrates an important point about target date funds: they are not all the same. In fact, some target date funds – such as ones offered by T. Rowe Price and American Funds – have equity allocations that don't stop descending for up to 30 years beyond the target date[i]. When it comes to target date funds, there is no such thing as typical. As depicted in Figure 4, target date funds’ equity allocations vary across all horizons. At the target date, the equity range is from 22% to 53%. That range seems wide – remember, these funds presumably were designed for a person in the year they will retire. At 22% equity, the portfolio could lose about 5% in a bad year, while the 53% equity portfolio could lose about 12% in a bad year. Yet both funds have the same target date. It seems like these funds ought to come with advice! As beneficial as target date funds may be, when used in isolation they are an insufficient retirement planning solution. Investing in target date funds typically is a better way for retirement savers to invest than doing it themselves. 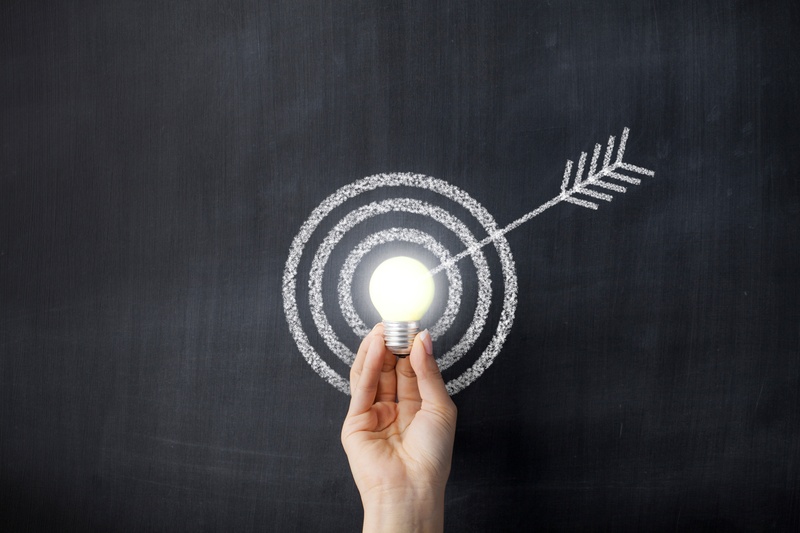 Target date funds typically allocate more to equities than individual investors might do on their own, and they offer better diversification than DIY investors tend to achieve. However, target date funds have drawbacks. Funds with the same target date can employ very different degrees of portfolio risk, so investors should obtain an opinion from an independent party whether their target date fund’s glide path seems reasonable for their situation. Additionally, investors should still seek advise about how much to save and for how long. GuidedChoice advises savers based on their situation. Our advice tools allow savers easily to compare different choices for saving outside their plan, retiring at a different time, and changing the allocation of their portfolio. It allows them to use professional-caliber wealth planning tools for their own personal needs.